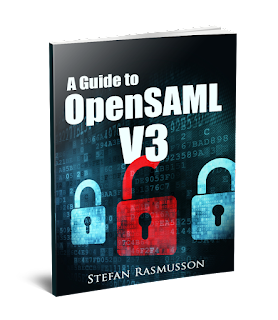 I'm currently using OpenSAML V3, I purchased your book and try to follow step by step with the sample project as a guide. In the 4th step, I recive the response and try to validate it, in order to do it I need the IDP credentials. In real life, I have a Certificate file "example.cer" and have to somehow create a Credential object to use it in the validation. I can´t find a way to do it, I tried puting the certificate in a .jks but when you use the KeyStoreCredentialResolver you need a passwordMap, it has none because truststores by definition are a keystore without private keys, so you get "java.lang.UnsupportedOperationException: trusted certificate entries are not password-protected". But then you have a problem casting it, you can't cast a BasicX509Credential to a Credential. - if you run the code as is, you get "A KeyInfoCredentialResolver instance is required"
net.shibboleth.utilities.java.support.component.UninitializedComponentException: Component 'bfdd2fdf-4dab-42ed-ae55-1fa932edf088' has not yet been initialized and cannot be used. But I haven´t been able to fix it and make it work, the instantiation of the keyinfocredentialresolver was from some forum, I don't have much idea of how it really works. 1) The getSimpleCredential also takes a PrivateKey that you shouldn't have, to validate a signature you only require the certificate of the IDP (I'm validating the response from the IDP). credential is required to be of the class Credential, not a BasicX509Credential, and as far as I know you can´t cast from one to the other. So how could I get an object "Credential" from the .cer file or the Metadata? Or if there is no way, how could I cast from BasicX509Credential to Credential? That corrections where what I needed, the Uruguayan governmental electronic identification team thanks you for your quick response and good disposition! We will probably keep contacting you in the future if something comes up. can you please elaborate a bit more on how you solved the issue? I tried getting the certificate from the xml the way Fran described, but I got the same errors. Alternatively, I tried to get through the EntityDescriptor, but I get a xmlsec X509 certificate that I'm not able to convert into a credential to test. 2. As Stefan answered me a few comments ago, the BasicX509Credential returned from Credential support is org.opensaml.security.x509.BasicX509Credential and not org.opensaml.xml.security.x509.BasicX509Credential which can be recasted. That worked for the certificate file. Any luck with the metadata? The metadata was a way that I didn't take nor investigated after it was solved with the other method. Maybe if you have a more specific question I could have an idea and help you solve it. To be honest I don't have much experience with metadata aplications but I would be happy to try to help! Hi Stefan, i integrated saml with my web application . My query is how to get the assertion from SAML after authentication. I have one more external application which is invoked internally from my first web application. I want to retrieve the SAML assertion. com.sun.identity.saml2.meta.SAML2MetaException: Unable to verify signature under element "EntityDescriptor". The signing certificate etc are imported in openam keystore and are valid ones, not sure what is why openam is throwing error while configure Remote SP. ALl was fine with opensaml2, issue is with opensaml3. Ok, have you checked if there is any difference between the metadata produced from v2 and v3? If you .initialize() that inlined new BasicRoleDescriptorResolver(idpMetadataResolver) you'll get rid of that net.shibboleth.utilities.java.support.component.UninitializedComponentException: Component 'bfdd2fdf-4dab-42ed-ae55-1fa932edf088' has not yet been initialized and cannot be used. Do you know if there is a convenient way of validating assertion conditions. Looking through the code, I see there is a SAML20AssertionValidator class which has a validate method that performs validation of signature, conditions, subject confirmations etc. I was hoping this would be useful, but I am unsure of the way it is instantiated and used. For now, I am manually verifying the notBefore and notAfter conditions of an assertion. Have you dealt with this before? enterprise security audit I really appreciate this wonderful post that you have provided for us. I assure this would be beneficial for most of the people.